If you are interested in this review, author Philipp Rode will be launching his book at the event ‘Governing Compact Cities’ at LSE on Monday 18 June 2018. Further information on how to attend can be found here. 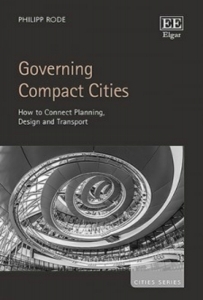 Governing Compact Cities: How to Connect Planning, Design and Transport. Philipp Rode. Edward Elgar. 2018. Philipp Rode’s new book, Governing Compact Cities: How to Connect Planning, Design and Transport, looks at the institutional arrangements that enable sustainable cities. It starts with the recognition that in many cases, sustainable cities are also compact cities, characterised by mixed-use neighbourhoods and by transport systems oriented towards public and non-motorised modes of transport. But cities in countries with similar income levels can be at different stages of densification and motorisation. There are sprawling cities in North America and the Gulf region where up to 90 per cent of trips are still made by car, and other cities (mostly in Western Europe) that are re-densifying and where car ownership and use have started to decline. Demographic and social factors alone cannot explain these differences – urban policy and governance must also play a role. There is some research on ‘what to do’ to achieve compact cities (for example, regenerating decaying central areas). But this book brings new knowledge by addressing a different question: that of ‘how to do it?’ In London and Berlin, the two cities studied in depth in this book, the ‘how’ involves a greater integration of urban planning, city design and transport policy, involving policymakers, practitioners and other stakeholders working across sectors and different geographic and time scales. This is material that could reach a wide readership, including people with different backgrounds and interests, such as public policy, transport, urban planning and sociology. But the book is a dense academic treaty that some may find difficult to navigate. Readers have to wait until page 32 to view the first results of the research in London and Berlin, after a jargon-dense introduction and an (interesting and informative) overview of urban density and sustainable transport trends around the world. But 25 pages later, we are back to the theory in Chapter Three, a long discussion of planning and policy integration. The bulk of the empirical analysis of London and Berlin is in Chapters Four and Five, which can be read independently as they are self-contained units, almost like extended academic papers. The research is based on document analysis and twenty interviews with key stakeholders in each city, including several political and administrative leaders/ex-leaders. In these chapters, we find some interesting insights about how the two cities evolved since the 1990s towards more integrated urban governance. Both cities have evolved towards an ‘X-shaped’ type of governance (represented in a nice diagram on page 220), which is characterised by horizontal integration across sectors at the city level and by less integrated structures both at the national level (responsible for defining budgets and legal frameworks for the different sectors) and the local level (responsible for implementing the projects). In both cities, the integration at city level materialised through a combination of hierarchy and networks. Urban and transport policymaking were concentrated within a large organisational unit (the Greater London Authority in London and the SenStadtUm in Berlin) that develops a strategic vision for the city and has a clear leadership (namely, the Mayor of London and the Senator for Urban Development in Berlin). This was complemented with increased communication and collaboration between practitioners in the public, private and third-party sectors – what Rode calls ‘networked technocracy’. This integration within and across institutions takes time between the establishment of new mechanisms and their translation into different policies on the ground. In the case of Berlin, some of the ideas for increased integration that were first developed in the early 1990s were only implemented as concrete policies ten years later. This underscores the need for integration across time, ensuring the continuity of processes and of working relationships within networks. The book also shows that the development of a new policy agenda (such as that of the compact city) may not be enough to achieve integration, which often occurs as a part of broader institutional changes occurring at the same time. In Berlin, this happened in the context of Germany’s reunification and in London as part of the New Labour political momentum of the late 1990s. But there are also several differences in the way the cities achieved integration, with Berlin relying on a greater degree of concentration of powers in high-level institutions and London dependent on coordination between separate institutions. For example, in Berlin, the strategic and implementation powers regarding transport are concentrated in a single organisation, meaning the coordination between urban and transport policy can be done ‘in house’, while in London they are split between two (related) organisations, the Greater London Authority and Transport for London, which requires effective communication and relationship-building between teams and individuals in both. In another example, Berlin has a joint institution dealing with issues that cut across the administrative borders between the city and its hinterland, while in London this is done through coordination between the city government and surrounding local governments, facilitated by the national government. Overall, this is not an easy book to read as it remains at a conceptual level from start to finish – it is a rare case when the book becomes somehow more academic than the original PhD thesis. Personally, I enjoyed reading the book, because it adds detail to a similar project I am working on looking at the shift towards more sustainable transport policies in London and Berlin (and another three cities) over the last decades. But I recognise that not all readers will have this motivation. Nonetheless, those readers who are willing to take an abstract, high-level view of things will learn much about how institutions work and shape urban and transport policies in two successful cities. The book is an important contribution to the study of urban governance and offers rich information to those interested in how London and Berlin evolved from car-centred to more sustainable and compact cities. But the main value of the book is to individuals involved in urban governance in rich cities that are still at the car-centred stage and in cities that are rapidly growing bigger and richer and where there is still a choice of pathways, some more sustainable than others. Paulo Rui Anciaes is a researcher at the Centre for Transport Studies, University College London. He completed his PhD at the Department of Geography and Environment of the London School of Economics. Paulo blogs about Community Severance and Alternative Environmentalism and contributes to the UCL Street Mobility project blog. Read more by Paulo Rui Anciaes.